The jackpots for both Powerball and Mega Millions are above $US300 million as of Thursday morning. The Powerball jackpot for Saturday’s drawing is up to $US384 million as of 11 a.m. ET Thursday. Meanwhile, the Mega Millions jackpot for Friday’s drawing is up to $US306 million. Those are pretty huge chunks of money. 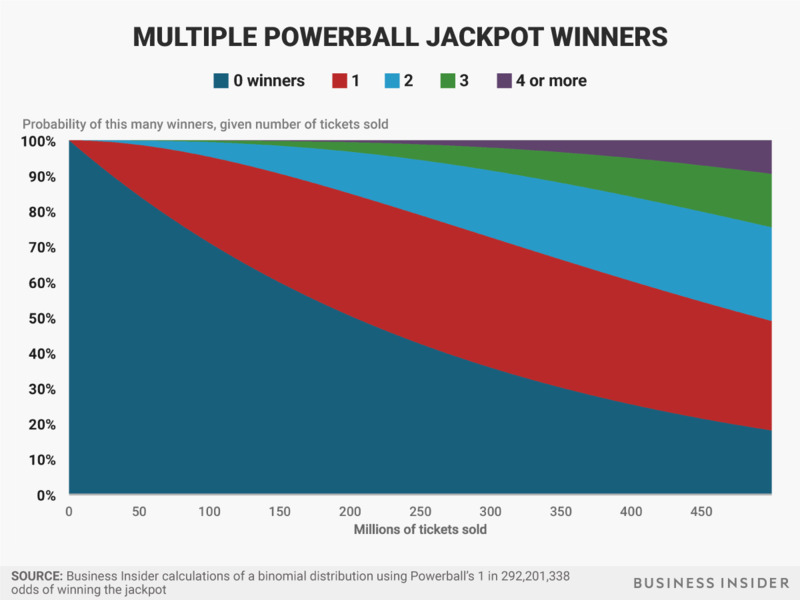 However, taking a closer look at the underlying maths of the lottery shows that it’s probably a bad idea to buy a ticket. 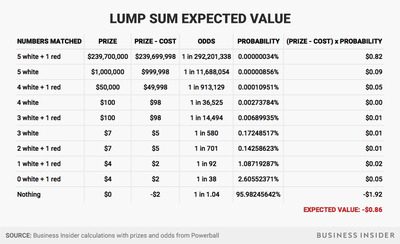 Lotteries are a great example of this kind of probabilistic process. In Powerball, for each $US2 ticket you buy, you choose five numbers from 1 to 69 (represented by white balls in the drawing) and one from 1 to 26 (the red “powerball”). Prizes are based on how many of the player’s chosen numbers match those drawn. Mega Millions is broadly similar – you choose five numbers from 1 to 70 and a final number from 1 to 25. 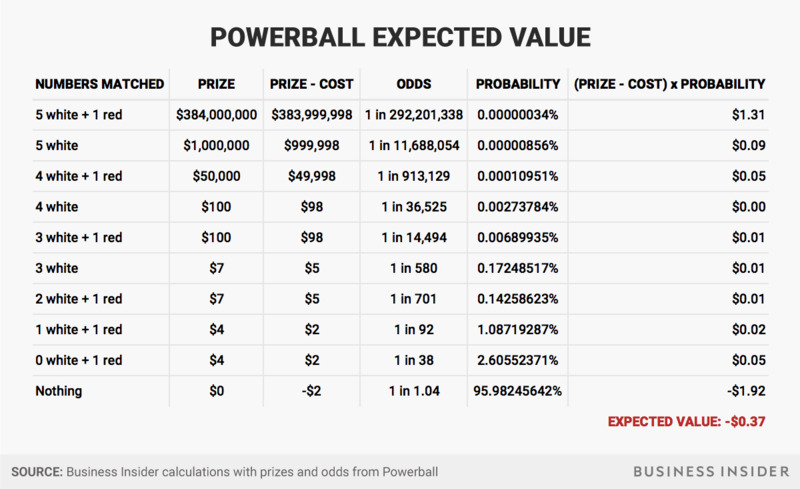 The Powerball and Mega Millions websites helpfully provide a list of the odds and prizes for those games’ possible outcomes. We can use those probabilities and prize sizes to evaluate the expected value of a $US2 ticket. For our example, we’ll focus on Powerball. The calculations for Mega Millions are similar. We end up with a negative expected value of -$US0.37. That already suggests it doesn’t make sense to buy a ticket, but considering other aspects of the lottery makes things even worse. 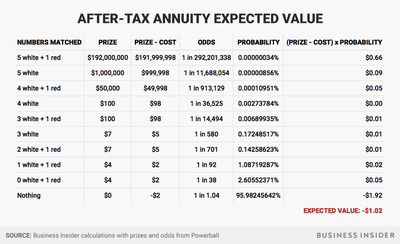 First, the $US384 million jackpot is paid out as an annuity, meaning that rather than getting the whole amount all at once, it’s spread out in smaller – but still multimillion-dollar – annual payments over 30 years. If you choose instead to take the entire cash prize at one time, you get much less money up front: The cash payout value at the time of writing is $US239.7 million. 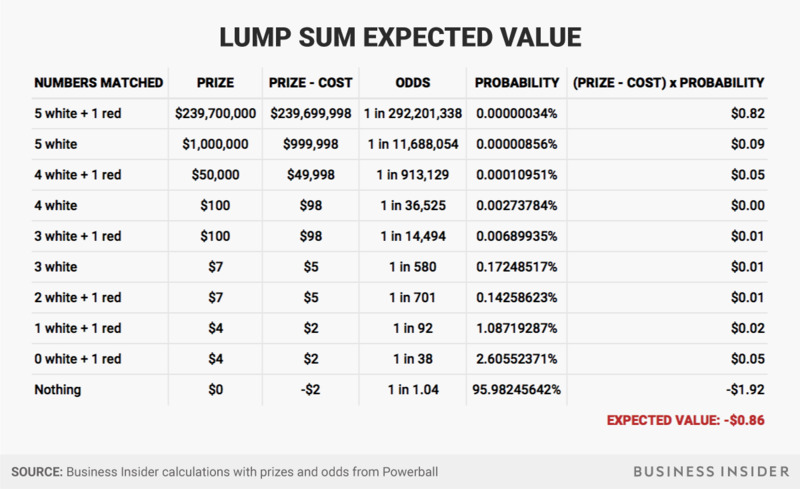 If we take the lump sum, then, we end up seeing that the expected value of a ticket drops further below zero, to -$US0.86, suggesting that a ticket for the lump sum is also a bad deal. The question of whether to take the annuity or the cash is somewhat nuanced. 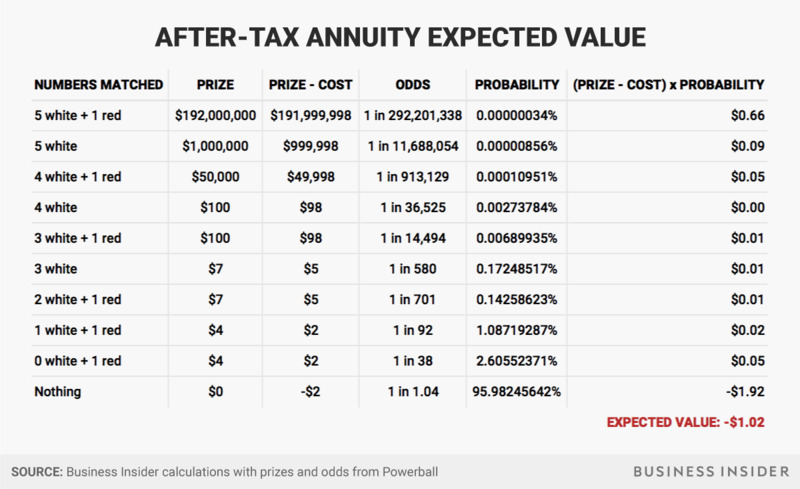 The Powerball website says the annuity option’s payments increase by 5% each year, presumably keeping up with or exceeding inflation. 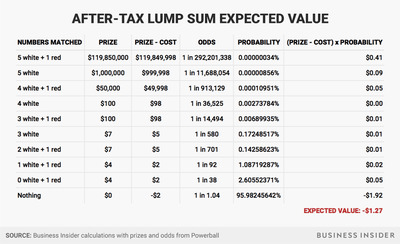 Factoring this in, if we’re taking home only half of our potential prizes, our expected-value calculations move deeper into negative territory, making our Powerball investment an increasingly bad idea. Here’s what we get from taking the annuity, after factoring in our estimated 50% in taxes. The expected value drops to -$US1.02. 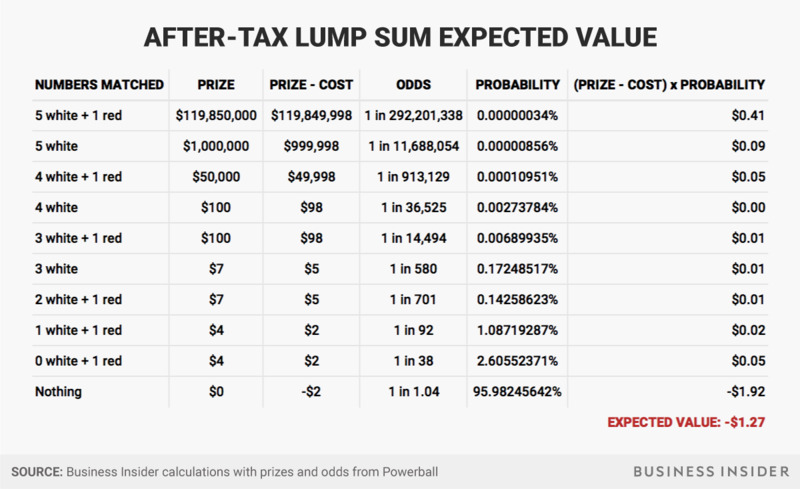 It’s worth noting that the binomial model for the number of winners has an extra assumption: that lottery players are choosing their numbers at random. Of course, not every player will do this, and it’s possible some numbers are chosen more frequently than others. If one of these more popular numbers is drawn on Saturday night, the odds of splitting the jackpot will be slightly higher. Still, the above graph gives us at least a good idea of the chances of a split jackpot. Most Powerball drawings don’t have too much of a risk of multiple winners – the average one so far this year has sold about 22 million tickets, according to our analysis of records from LottoReport.com, leaving only about a 0.3% chance of a split pot.